Friedrich Kuhlau, composer and pianist, was born on September 11, 1786 in Uelzen (Germany, near Hanover) and died on March 12, 1832 in Copenhagen, Denmark. He is considered one of the foremost representatives of late Classical Period (1750-1825) and early Romantic Period (1825-1900) music in Denmark. He composed a wide variety of music including several Operas and a large number of works for Piano (solos, chamber works and one concerto) and, of course, the Flute: Solo Flute (Op. 10a, 38, 57 & 95); 2 Flutes (Op. 10b, 39, 80, 81, 87 & 102); 3 Flutes (Op. 13, 86 & 90); 4 Flutes (Op. 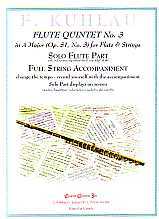 103); more than a dozen works for Flute and Piano; and the 3 Quintets (Op. 51, composed 1822) for Flute and Strings (Violin, 2 Violas & Cello). It is often incorrectly assumed that Kuhlau played the Flute - he did not! - 4th Movement (2/2, Finale, Vivace, half = 100).